Moojic is a new app that gives guests the remote control to the a�?jukeboxa�� at cafes, bars and other public establishments, and helps personalise a play list. a�?Moojic is inspired by the old jukeboxes. We wanted to revive them digitally, while making it more interactive,a�? begins Neha Behnani, founder, as her partner Kumaran Mahendran adds that it is all about playing tunes from a customera��s perspective. 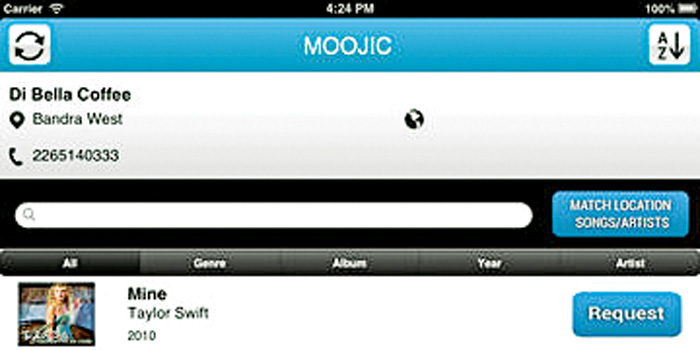 Moojic allows you to request a song inside a Moojic-powered location, like a restaurant. And if the song is on the pre-approved list by the enterprise, then youa��ll get to listen to it. As of now, Moojic is only for commercial use at retail or commercial spaces, with features tailor-made for them. However, you can soon expect an app for personal use, which means your party will never have bad music again!A�a�?We all realise how important music is to our experience at locations. When with friends, we all want to play the songs that we all connect with, isna��t it? Sometimes, when alone at a cafe, a favourite song can just uplift your spirits,a�? says Behnani, elaborating that it balances the desire of the commercial properties to please customers and the fact that it can be inconvenient to pander to every request. Not only can you request the song, but you can even view the playlist, see lyrics of the current playing songs, and dedicate songs to your Facebook friends. Fast-forward to the future a little and youa��ll have features like votes to bring songs up a queue or even crowd-course the mood of a location to get the party started.